Dr. S. Lance West completed his undergraduate work at the University of Florida in Gainesville and Samford University in Birmingham, Alabama, where he received a Bachelor of Science in biology with a minor in chemistry. He attended Marquette University School of Dentistry, where he was awarded his Doctorate of Dental Surgery in 1998. Dr. West received his license to practice dentistry by the State of Florida in 1998 and has been in private practice in Sarasota since then. He joined the team at Family Dentistree in October 2000. Originally from Tampa, Dr. West now lives in Sarasota with his beautiful wife Michelle. They have two wonderful and gifted daughters, Savannah and Alexandra. Dr. West’s parents also live Sarasota, and they enjoy being able to have big family events together. Dr. West and his family are avid travelers and always excited to experience new places and adventures. His girls are involved in many sports activities, and they constantly amaze Dr. West and Michelle with their endeavors and accomplishments. As a family, they enjoy snow skiing, biking, going to the beautiful Florida beaches, photography, fishing, theme parks, and all kinds of outdoor activities. They are huge Florida Gator sports fans and enjoy going to games and cheering on the Gators. 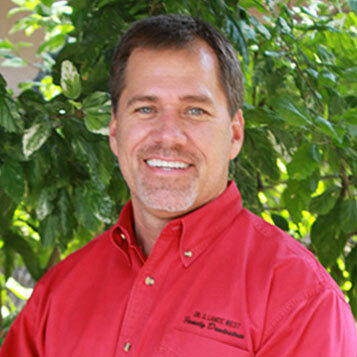 Dr. West is also an automobile enthusiast and loves the design and engineering aspects of innovative cars.